The Edgartown Lighthouse Children’s Memorial marks its 10th anniversary this weekend, but its origins go back at least 15 years, perhaps 25. It may have begun in the mid-1980s, when Rick Harrington and his two young sons enjoyed the sand and sea and sunshine near the lighthouse during carefree Vineyard summers. 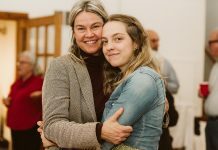 It may have begun soon after the terrible night in 1995 when Mr. Harrington received the life-shattering phone call that his son, Ricky, was dead at 16 in a car crash outside Boston. 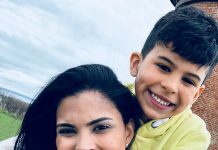 It took root during the long darkness of a father’s grief and began to blossom several years later when he saw a photo of a smiling, vital Ricky in front of the Edgartown Lighthouse, the jaunty motto “Just Do It!” emblazoned on his tee-shirt. The 10th annual ceremony of remembrance will take place on Saturday at 1 pm at the lighthouse. Mr. Harrington was born and raised on the Island. After high school he moved to Boston, where he began working as hair stylist. In a few years he had a salon of his own. In 1979, after marrying, he sold the salon and moved back to the Vineyard, where he and his first wife, Christine, raised his two sons. For many years, he operated a successful salon in Edgartown before moving back to Boston once again. With his deep connection to the Island, Mr. Harrington knew that the Edgartown Lighthouse was the right place to commemorate Ricky’s life. 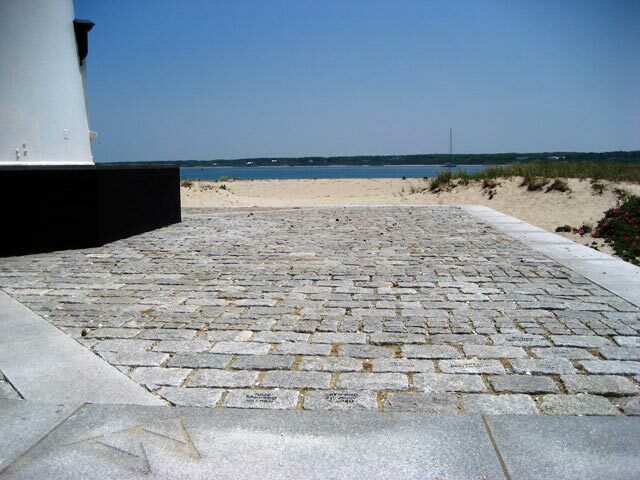 He envisioned a smooth sea of stone around the base of the lighthouse, a terrace paved with small granite blocks engraved with the names of children who had died. He brought his idea to the board of the Martha’s Vineyard Historical Society (now the Martha’s Vineyard Museum) as steward of the lighthouse, receiving a positive response, and joined forces with Matthew Stackpole, then the society’s director, and Craig Dripps, chairman of its lighthouse committee. Energized by passion for the concept, and with funds and support from friends and community members, the three pushed the project forward despite challenges. On July 14, 2001, the completed memorial with 120 engraved stones was dedicated. Today, the memorial — a simple, elegant plaza around the base of the lighthouse that bears the names of 542 children gone before their time — is a source of comfort to bereaved family members and friends. This weekend, many of them will descend the winding pathway to the historic lighthouse and honor their young loved ones once again in the annual Ceremony of Remembrance. More than a decade after first imagining the memorial, Mr. Harrington still receives calls and letters from grateful parents. He recalled a grieving father who journeyed from Canada to visit the memorial and see the stone honoring his son. “He told me it’s such a comforting thing to know his son’s name will be under that lighthouse forever,” he said. A mother confided that the lighthouse was her daughter’s favorite spot on the Island. An engraved stone now honors the girl, who was killed in an accident. Ten years ago the Edgartown Lighthouse was very different than it is today. The base was crumbling and the structure itself in decrepit condition, unsafe and inaccessible to the public. Mr. Harrington’s original dream was not only to repair the base and install the memorial but also to raise enough money to refurbish the entire lighthouse. He envisioned a spiral staircase by which visitors could once again ascend to be captivated by the panorama of sea and sky. In the middle of the decade, good fortune intervened in the form of both town Community Preservation Act (CPA) funds and a generous private donation. The museum applied to the town of Edgartown and received some $267,000 in CPA money for restoration and preservation of the lighthouse. Then, in 2007, Jonathan Blum, now a museum director, came forward with a contribution on behalf of his two sons and him, in appreciation of their wife and mother, Jennifer. The funds are specifically intended to cover expenses to keep the lighthouse open and accessible to the public. Mr. Harrington was thrilled to meet Mr. Blum, seemingly by coincidence, while playing in a tournament at the Vineyard Golf Club. He later discovered that his friend Gene Mulak, the head golf pro, had paired the two men up. “I was so touched by what he did, that he was so sensitive,” Mr. Harrington said about the thoughtful introduction. The lighthouse was opened to the public in 2008; its keeper, Wade Johnson, welcomes visitors throughout the summer and on Labor Day and Columbus Day. The site is available to rent for weddings, parties, and special gatherings. Those drawn here by the historic lighthouse often come across the memorial unaware, and they are moved by its significance. They may stop, contemplate, perhaps recall a loss of their own, according to David Nathans, director of the Museum since 2009. Museum staffer Betsey Mayhew handles requests for memorial stones. A gracious, soft-spoken woman and a parent herself, Ms. Mayhew lends a compassionate ear to the bereaved callers. Some tell her stories about their children, their fondness for Edgartown, how they lived and how they died. And they tell why they chose this memorial. Some of the children, like Ricky Harrington, played on this very beach, swam and sailed and fished in the waters below the lighthouse. Some came for summer jobs. Families may send in forms rather than calling, and they often enclose photos, letters, or articles about their youngster. Occasionally a stone is given as a meaningful gift to a bereaved family by relatives, friends, coworkers. Some request the stone have a special location, near a friend, or facing a specific direction. One family asked for their child’s stone to be oriented towards downtown Edgartown and a favorite candy store, another in the direction of their home in Trinidad and Tobago. The names represent children of all ages, newborns, teenagers, and even some adults, for to a parent a child remains a child, no matter the age. Although mostly from the New England region, they lived in states across the country, in Canada and abroad. A number were part of the year-round Island community or regular summer residents. New stones are engraved and placed by Dudley Levick twice a year; a map and list at the site indicates the position of each child’s stone. An engraved stone may be purchased for $250, a cost that hasn’t changed since the memorial began. Saturday’s observance will include brief remarks and music by Regional High School principal Steve Nixon. An educator, Mr. Nixon is also an accomplished musician and will perform two original pieces. Families and friends will gather as they do each year for the program and simple summertime refreshments from the Harbor View Hotel. Many will bring mementoes — a single rose, seashells, photos, a bunch of wildflowers — to place on their child’s stone. And they will receive the wordless comfort of joining with others suffering similar loss, and the healing and hope that nature imparts. Deveastated after his son’s death, Rick Harrington’s life changed forever. He credits the support of loved ones and his Catholic faith for seeing him through. In time, the sense of desolation diminished. He threw his newfound energy into bringing the memorial to fruition. These days, Mr. Harrington is once again a sought-after hair stylist. He lives in Brookline with his wife, Susan, and takes great pride in his son, Blake, 28, who works in the health care field in Atlanta. And when time allows, he visits the Vineyard, catches up with friends, enjoys a game of golf, and walks down to the Edgartown Lighthouse to visit Ricky’s stone, breathe in the soothing sea air, and remember. Edgartown Lighthouse Children’s Memorial, 10th annual Ceremony of Remembrance, Saturday, Sept. 10, 1 pm. Rain date Sept. 17. For information or to purchase a stone, call Betsey Mayhew, 508-627-4441, ext. 112.